Chenga was adopted in April 2004 by Cheryl, Larry, Matt and Olivia. Cheryl and Larry write, " Our son, Matt, loves cats and he wanted another cat to go along with his 9 year old tonkinese, Simba. So for his 16th birthday we adopted Chenga. Chenga is now part of our family and is doing very well with Simba. They are always within five feet of each other with Simba always looking out for him. They play and chase each other around the house all day and are great together." 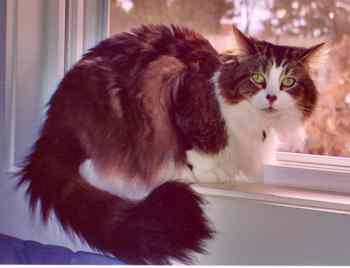 Phoebe was adopted in December 2003 by Jennifer, who writes, "She is doing very well. At first she was extremely shy and would not come around to anybody but now she loves attention and loves to give kisses. Pheobe is having lots of fun with her friend Sully; all they do is play with their toys and lounge in their hammock all day and watch the birds outside." 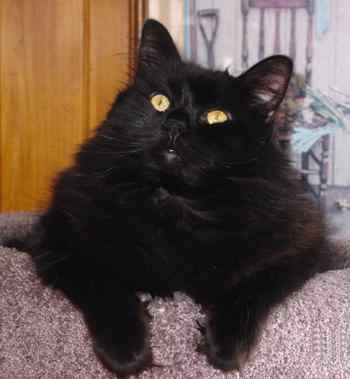 Duke was adopted in 2003 at the age of one year by Sue and Jim, who write, "Duke is a friendly, lovable bundle of long beautiful black fur. He is the sweetest cat and just loves everyone and to play with his brother Ernie. Both boys get along extremely well with each other, they can usually be found sitting together looking out the basement window or laying in the sun in the kitchen. 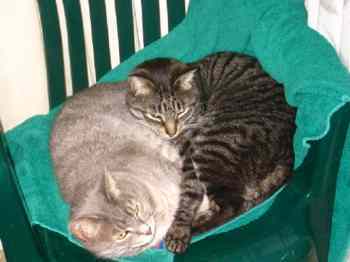 Both Ernie and Duke get along extremely well with the queen of the house, our 5-year old female cat, Harley." Casey was adopted in February 2003 by Christie, who writes, "He is doing really well and is such a good boy! He is a great companion and he likes to talk a lot. He has two little sisters at home to play with, so he has some friends, and they love him. "When I first got him, he had frostbite on his ears and his fur was a mess, but as you can see, he cleans up well. He has the best green eyes and his nose is shaped like a heart. "He doesn't look that big in this picture, but he weighs at least 15 pounds. I just wanted to let you know that he is doing really well and we love him a lot." 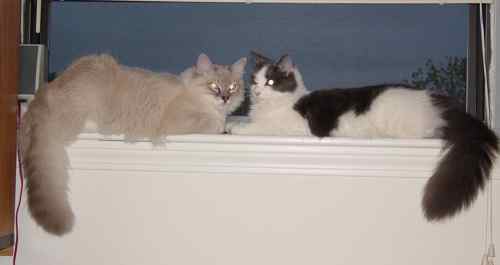 Diddy and Heidi were adopted in September 2003. 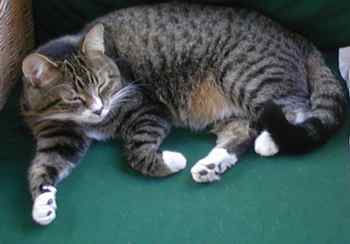 Their new owner writes, "Diddy, a super outgoing cat, immediately decided that he was home. He has helped Heidi become comfortable here by his example. 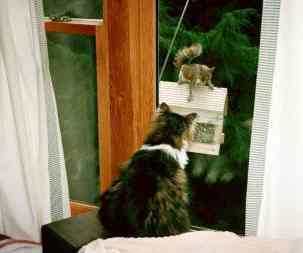 Heidi was a feral cat. Though it has taken months, she now greets me each morning and wants to be pet. It will probably be another year before she jumps in my lap, but she has a long life ahead of her. These two are inseparable." Tish was adopted by Mary Lou, who writes, "I came to Kitty Angels and adopted a kitten that was left at a recycling center in Derry NH. Those kittens were approximately 4-5 weeks old and were just weaned from their mother. On the ride home, she fit in the palm of my hand and now she is over 10 pounds. Just wanted you to know she is still around and doing great. Thank you so much for the work you do there."